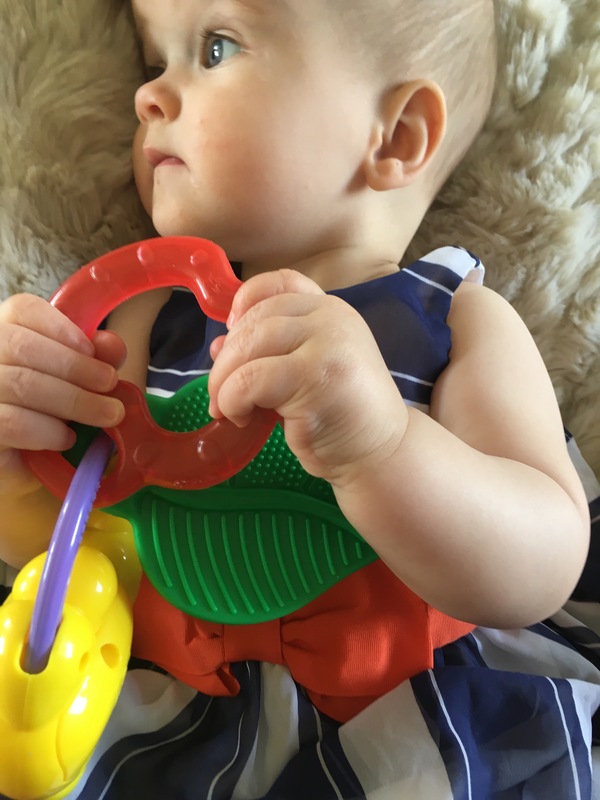 So BBG started to teethe last week… now my others never suffered too badly but each child has had to have a teether. 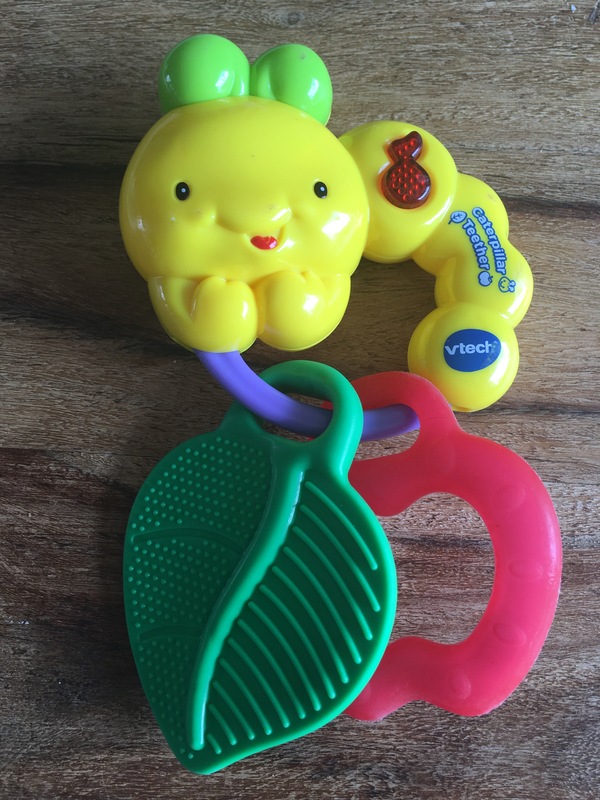 So I decided to buy BBG the Vtech Caterpillar Teether. Now I don’t generally review random things however this teether I needed to write about. And 2- BBG has got to the teething time around the right time, it’s the first development stage she’s not delayed in so I am slightly excited that I’ve even had to buy a teether! So I didn’t want lots of teethers, I wanted one which would do the job. BBG can’t grasp certain toys. She needs a chunky toy. 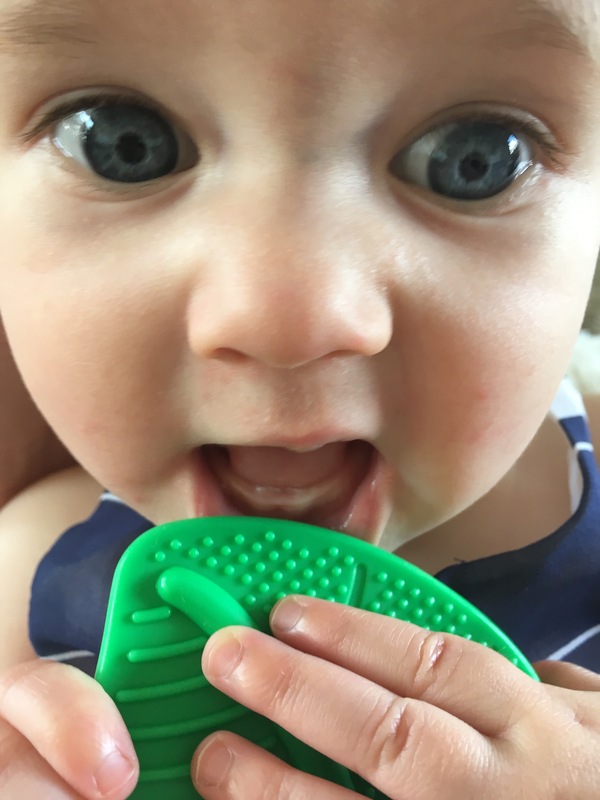 Now a lot of teethers have maybe a handle, or are just 0.5cm thick pieces of flexible textured rubber which just wouldn’t help our BBG, plus are easily lost! I then saw the Vtech teether. 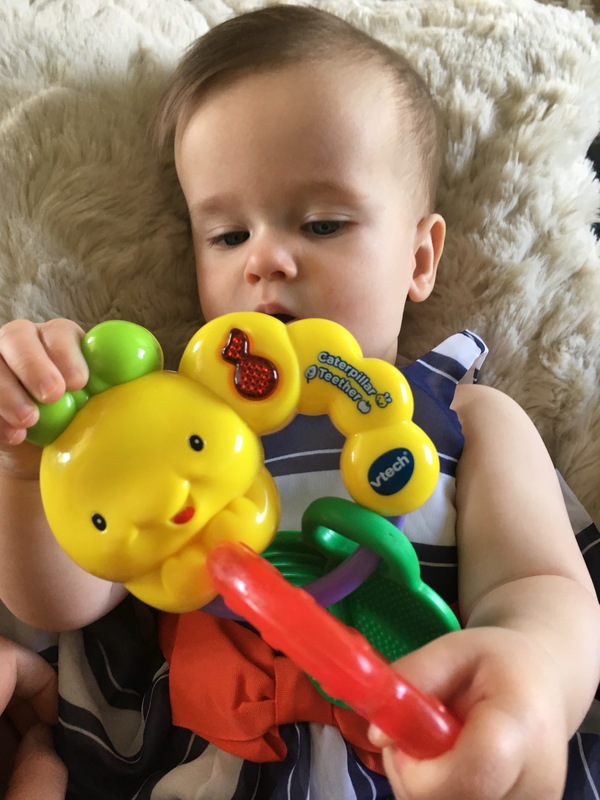 It doesn’t look like a teether, it sings and has a light up musical note…. but I thought I’d try it out. It is perfect for BBG. The caterpillar is large and chunky so BBG can grab hold of him, and then she squeals in delights as she’s generally touched the music button, and so gets a surprise song sang to her. Her favourite is when the catapillar talks about munching leaves. Once BBG has got the catapillar initially and brought it towards her, she can then happily swap between the Apple and leaf to play with, which is such a bonus. I did look and think ‘o I can’t put it in the freezer’. 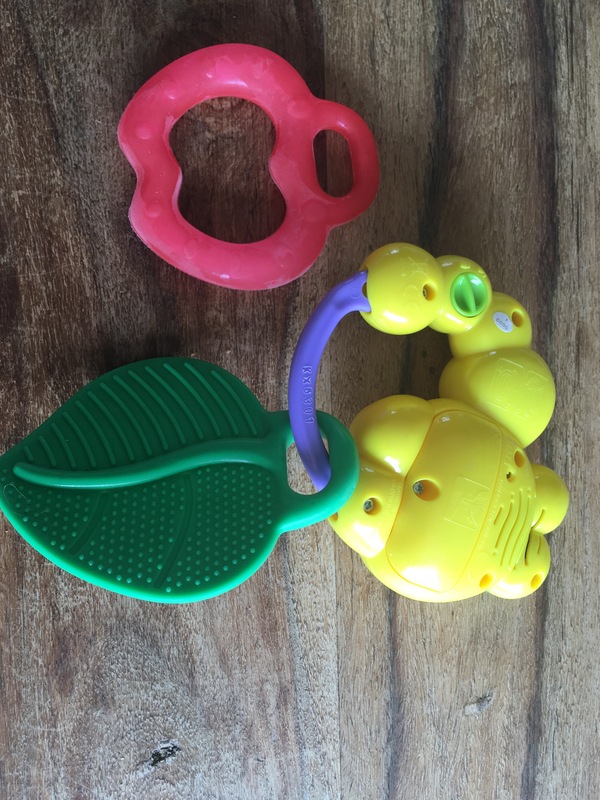 Then turning it around I saw the lock, it actually unlocks meaning the Apple toy can go in the freezer leaving the leaf teether still attached, this means you don’t need spare teethers, one for the freezer and one for playing with…. it’s all in the one toy! 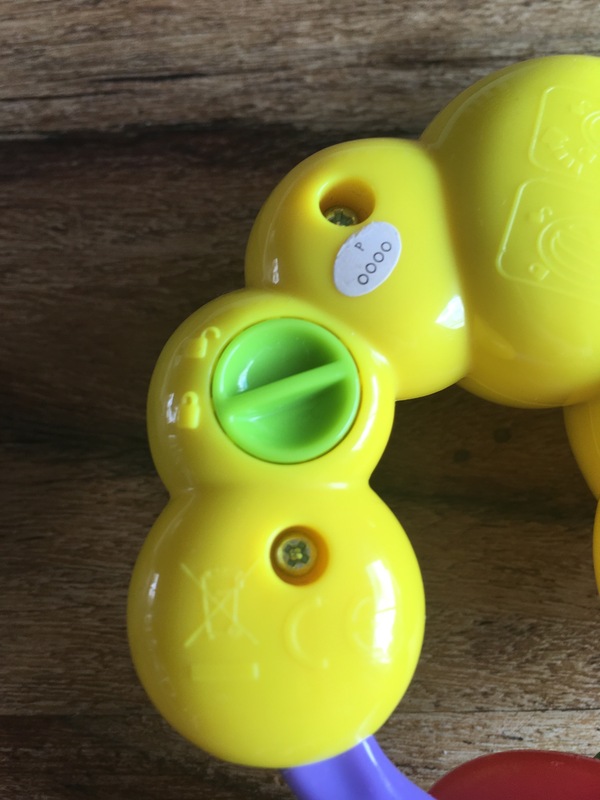 Plus the handy hook and lock means you can detach and add different teethers you have if you wanted to and is a handy storage place for them. Sort of like a teether keyring, very practical! 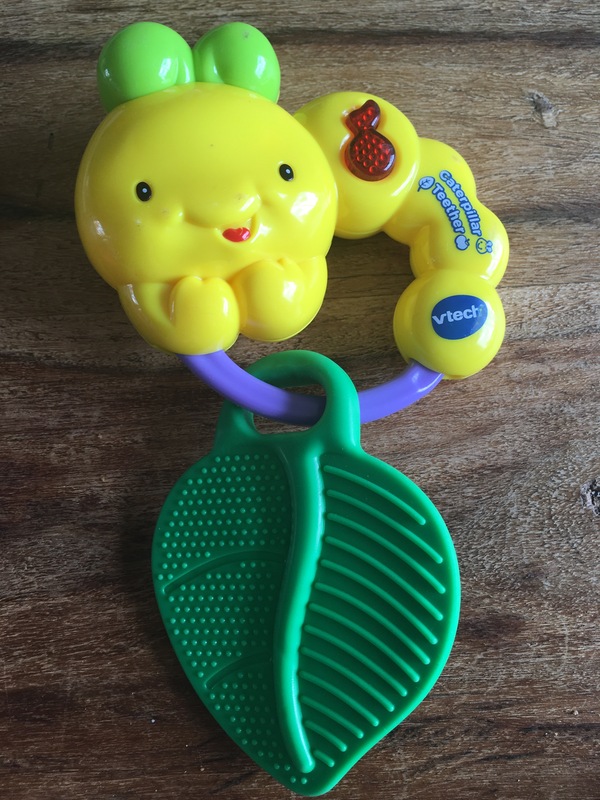 What more can I say about a teether… well my daughter loves it and will go to either the frozen apple or the green textured leaf. We’ve found it particularly good as it’s perfect to practice her physio on and getting her to reach and track the toys due to its bright colour, sounds and dangle teether toys. So yes it’s more expensive then most teethers but for us where the initial grasping is an issue the size is perfect. The fact she can choose between a frozen or textured toy is wonderful. This can be given in her pushchair and all be clipped safely together meaning it would be harder to loose. The fact we can mix it up with the physio and sensory equipment is an amazing bonus! All I could say is try it out. BBG loved it, I love it so what more can you ask for then a versatile toy that can help you out in the teething months! I brought this toy and have not been asked to review this product I just personally had to say I love it!